Calgary has been considered a prototypical Canadian city since 1988, when it became the country's first city to host the Winter Olympics . It is located in the heart of Canada and boasts the country’s third most populated metropolitan area, despite maintaining a distinct "wild west" style. Calgary is also geographically unique since it is located where the Elbow and Bow Rivers meet, 80 kilometres east of the majestic Canadian Rockies. If you are interested in Western Canada’s biggest city, you’re not alone. 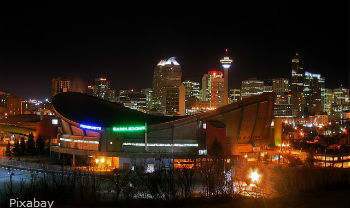 Calgary has become a prime relocation destination in recent years. 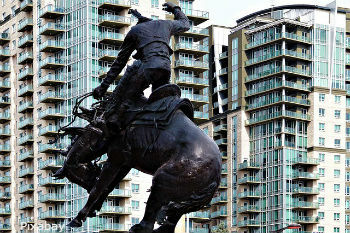 Read on to learn all about what “Stampede City” has to offer. Calgary’s climate is technically “humid continental,” according to its Köppen classification. Don’t let the name fool you-- Calgary has the highest percentage of sunny days of any large Canadian city and receives only 419 millimetres of annual precipitation. Calgary’s summer days typically range from 9 to 25 degrees Celsius, while temperatures in midwinter average highs of -1 and lows of -13. Occasionally, Calgary experiences extreme weather. Unseasonably warm Chinook winds from the adjacent Canadian Rockies blow over the city periodically during the winter. This hot, dry air can raise temperatures by over 20 degrees Celsius and the heat boost can last several days at a time. The city also gets 129 millimetres of snow and about 20 thunderstorms a year. On rare occasions, Calgary can fall victim to hailstorms. A particularly devastating hailstorm hit the city in 1991, inflicting over $400 million in damage. Calgary is made up of over 180 distinct neighbourhoods. The city’s downtown area is divided into five of them: Eau Claire, Downtown West End, Downtown Commercial Core, Chinatown and Downtown East Village. These business-focused neighbourhoods are the part of town where residents pay higher prices for real estate so that they can pay lower prices for public transportation. The Beltline is a more residential neighbourhood, which 9th Avenue separates from downtown. It is the most densely populated area in the city. The Beltline historically gets special attention from city initiatives to revitalize the core of Calgary. The government wants the Beltline to be densely populated and desirable because it wants to combat urban sprawl, which has been a problem for the city. Demographically, Calgary is diverse. Roughly 28 percent of Calgary’s 1,195,000 residents belong to a visible minority. Chinese and South Asians are the most common minorities in the city and they normally live in culturally distinct neighbourhoods like Chinatown. Calgary's population is moderately diverse when it comes to religious beliefs. The majority (55 percent) of Calgarians identify themselves as Christians, while 32 percent have no religious affiliation. Most of the remaining 13 percent consist of small communities of Muslims, Sikhs and Buddhists. If you're worried about crime, Calgary is moderately safe in most of its neighbourhoods. It has a low crime rate compared to similarly sized Canadian cities, according to a 2012 article published in Maclean’s, a Canadian magazine. However, in 2014, CTV News reported a slight uptick in Calgary’s violent crime. It is important to research the crime rates of prospective relocation sites, but it is also crucial not to let these statistics be the determining factors. If you are bringing your car to Calgary from outside of Alberta, you have 90 days to register your vehicle and get an Alberta license. Your vehicle will also need to pass an Out of Province Vehicle Inspection before it can be registered. Temporary workers with legally registered cars can use their old license and registration in Alberta for 183 days/6 months. Full-time students can use their previously registered vehicles for the duration of their studies. For more information about getting your car registered, visit Richmond Road Registry, an Alberta government authorized registry website. The Calgary Board of Education runs the English language public school system in the city. For Calgary’s Catholic students, there is a separate board of education: the Calgary Catholic School District. There are also Calgary-based francophone schools, but they belong to a district that serves a much broader area than just Calgary, since there are not many French speakers in the region. If you're looking for higher education, Calgary is home to a bunch of post-secondary schools. The University of Calgary is the largest institution and regularly enrolls over 28,000 students a year. SAIT Polytechnic and Mount Royal University are also large publicly-funded schools in the city. These are three of the biggest public universities in Calgary, but there are many others. Calgary also has several public colleges including Alberta College of Art and Design, Ambrose University College and Bow Valley College. There are just a handful of private colleges in Calgary: Reeves College, Robertson College, Columbia College and CDI College. Calgary has one of the healthiest economies in the world. The Calgary-Edmonton Corridor is blessed with oil as a natural resource, which helps drive the local economy. As Calgary became more prosperous, the financial service industry also started to grow around the headquarters of those oil companies since so much money was being exchanged in the area. The oil and gas industry is less dominant in Calgary now than it used to be, but it still is the leading contributor to the city’s GDP. In fact, more than ten major Canadian oil companies call Calgary home. In addition to the oil industry, Calgary has strong science, finance, management, construction and engineering industries. According to Statistics Canada, Calgary's current unemployment rate sits at 4.7 percent. Unfortunately, the booming business and influx of residents have caused the city’s cost of living to skyrocket. It now rivals Vancouver as one of Canada’s most expensive places to live. Aside from the increased real estate demand, inflation is also a major factor. Nearly everything is more expensive than average in Calgary, except for gas. Take a look at Numbeo’s cost of living calculator to learn more about Calgary living expenses. If you plan on traveling to Calgary, how will you get there? Calgary International Airport connects the city to the rest of the world and it also serves as a transportation hub for central and western Canada. The city functions as a road and rail destination as well, with both the Trans-Canada Highway and the Canadian Pacific Railway (CPR) mainline featuring Calgary as a major stop. As far as local transportation is concerned, Calgary Transit provides the city with busing and light-rail services. The light-rail system, called the C-train, carries 270,000 commuters on an average workday. Roughly half of Calgary’s downtown workers use the service for their commute. Alternately, there are over 260 kilometres of bicycle/walking paths. If you bike to work, you must share the path with pedestrians. As inconvenient as this may be, it is still cheaper and more environmentally friendly than driving or using public transportation. Like any city with a rapidly growing population, traffic can be an issue. In 2012, Calgary received official designation as one of Canada’s cultural capitals -- the city's diverse population and landscape truly represent what it means to be Canadian. International Avenue, within the Forest Lawn neighbourhood, is considered the most diverse part of the city. Here, you can find many ethnic and culturally unique stores and restaurants. The Southern Alberta Jubilee Auditorium is another Calgarian cultural hot spot. The “Jube,” as it's commonly called, hosts hundreds of musicals and plays each year. It is home to many professional ballet, opera and stage companies. Calgary also holds several seasonal events. Visual arts are well represented in Calgary festivals. For example, the Calgary Film Festival and the International Festival of Animated objects are held in town annually, and The Honens International Piano competition takes place every three years. Why is it held so rarely? The stakes are that high. The competition’s finalists perform with the Calgary Philharmonic Orchestra and the winner is awarded $100,000, along with a three-year music career development plan. That is the world's largest cash award for any international piano competition. There are many more cultural festivals held in Calgary, but any discussion of the city's events would be incomplete without mentioning the Calgary Stampede. This 10-day rodeo festival is tied to the city's old agricultural history. An annual tradition since 1912, it's become one of the most attended festivals in all of Canada. This rodeo is so noteworthy that it's earned Calgary its main nicknames: “Stampede City,” "The Heart of the New West" and “Cowtown.” There is nothing more distinctly “Calgary” than the Stampede. Does it sound like Calgary is the right destination for your move? If you need help transporting your belongings, you can get in contact with several Calgary moving companies right here on Topmoving.ca! Our database is full of companies that can move your belongings into, within, and out of Calgary. Visit the following pages that correspond with your desired moving service to view your options. Remember to get at least three estimates from different companies, no matter which service you need. Moving prices are fluid, so if you compare a few quotes and companies for your move, you can have more confidence that you are getting a competitive price. Bring warm clothes. Summers are sometimes cool, and winters are almost always cold. Budget wisely. 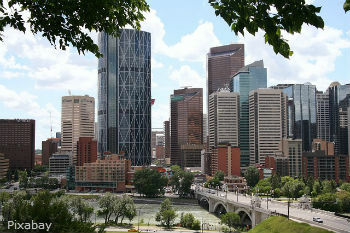 Calgary has a high cost of living and it seems to be trending upward. Look for a home early. Calgary's real estate market is currently very competitive. Check out the Calgary Stampede in July. It is the city’s biggest cultural event.